Well, not all that frivolous, but pretty frivolous for someone who has been doubled down on a uniform production and class prep. 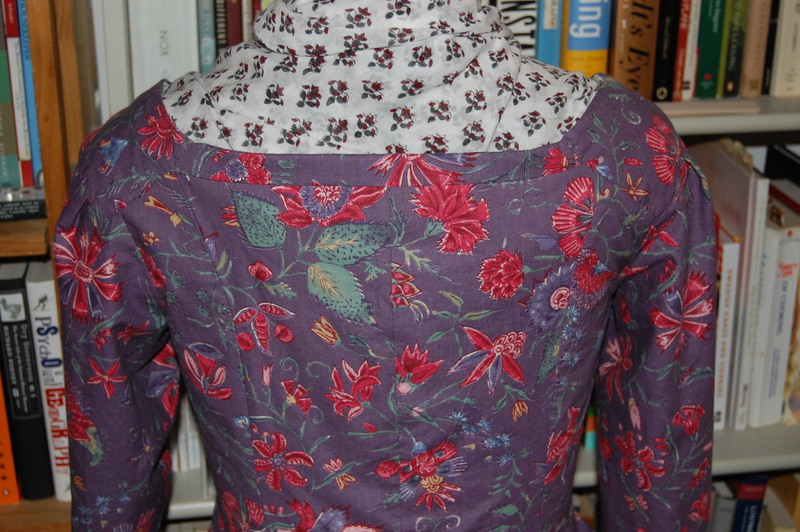 The remnant of chintz has turned into a nearly finished jacket, which is good. All that remains to do is the hem, and once the lining has been trimmed that shouldn’t be too hard. The pattern is an adaptation of the JP Ryan jacket pattern, with sleeve and length adjustments. It’s plain enough to pass, and with a striped “lincey” petticoat, will answer for New York-New Jersey servant wear. I have my eye on Monmouth. 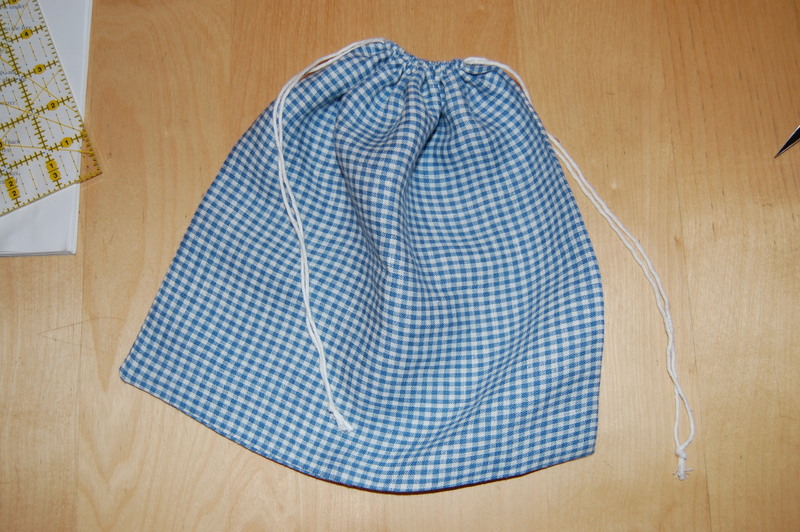 Also for Monmouth, the first of two checked linen bags. Small enough for toothbrush, comb, and other toiletries necessary in this century but out of place in 1778, these bags should help make camp packing lighter weight and more authentic. Hope so anyway, or what’s that backstitching and overcasting for, fun? I watched it for six months. SFRP! I am forever indebted to you for putting a scientific cast on my thrifty habits. THAT’S what the boxes, baskets and bins under my cutting-table (errrr) bed are really all about! 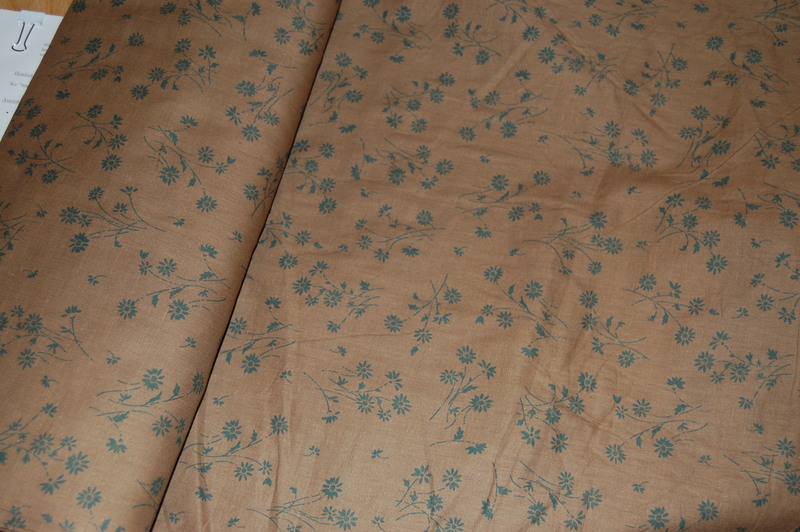 Love the light brown cotton. I could see a nice servants good dress out of that, but maybe with a huge fire-protecting bib apron over it? A wool apron would do the trick. I think it’s a lower class good dress, I just have to go to Newport to look at calico samples. And finish a bunch of menswear….. But I am itching for a new dress. More than 20 years ago, I first started cooking over an open fire at a living history museum where it was always 1836 (at least, at the time). Currently, I continue to do the same at various historic houses, sites, etc. My clothing for it all has consisted, and still consists, of an all-COTTON one-piece dress, a COTTON under petticoat (or two), and a COTTON apron. Never, ever, have I or my clothing caught on fire and burned up until nothing remained but dust and ashes. Yes, an edge may singe here and there, but THAT IS ALL! And more often than not, even when it happens, I’m totally unaware of it. In fact, I’ve often worn my 1830s outfit for a few days, taken it home to wash it, put it on again weeks later, and then and only then, I’ll suddenly notice a couple of little notches in the hem where it must’ve brushed up against hot coals or a small hole in the center of the apron where a hot ember must’ve landed. But that is all. I do not understand this “only wool won’t burn” way of thinking! It’s not true! Lastly, have you ever been to Old Sturbridge Village? What are the ladies wearing, even those who cook at the hearth? COTTON! So, what about the flaming burn test? Or are the 100% cotton fabrics that flame more than singe lying about their content? (Plausible, and I have not flame tested this.) The “rule” might be more mixed fibre based than anyone will admit. What I was pondering earlier was the armed services requirement that all undergarments be cotton, which I recall from WAC and WAAF uniform specs. The rule was all cotton, at a minimum so your underthings didn’t melt to you. So if cotton’s good enough for the Army, why not for cooking? If you’ve not gone up in flames, then I’ll burn test this stuff, and carry on as long as it’s not inferno-like.